(e.g., “Motorola smartphone” for Motorola) and also on generic searches (e.g., “smartphone reviews”). Because the performance metrics for ads shown against brand and generic queries can be vastly different, many advertisers prefer to analyze these two groups separately. For example, all else being equal, searches containing the advertiser’s brand name often have higher clickthrough-rates than those that don’t. To make analysis of brand and generic performance as easy as possible, we’re introducing a new feature which automatically identifies brand-aware paid search clicks tracked in Google Analytics. We use a combination of signals (including the clickthrough-rate, text string, domain name and others) to identify query terms which show awareness of your brand. You can review our suggested brand terms and then accept or decline each of them. It’s also easy to add additional brand terms that we’ve missed. With the resulting list of brand terms, we classify your paid search traffic in GA so that you can split your “paid search” channel into two separate channels: “brand paid search” and “generic paid search”. This can be done both for Multi-Channel Funnels (for attribution purposes) and for the main Google Analytics channel grouping. See this straightforward step-by-step guide to get started. "I've been arguing for many years that advertisers should look at their brand and generic paid search separately. There are massive differences in overall performance - but also in more specific areas, like attribution and new customer acquisition. 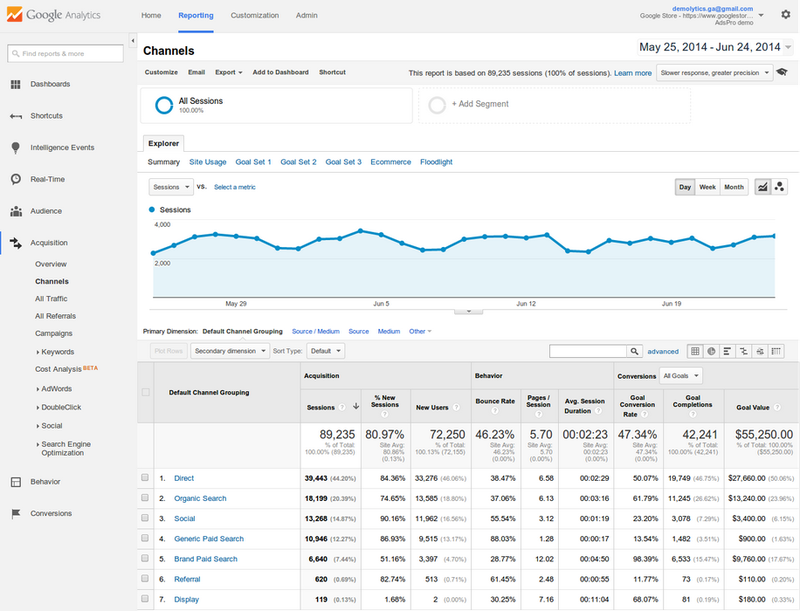 Google Analytics now makes it a lot easier for advertisers to segment brand and generic paid search into separate channels. I'm sure this feature will help many more advertisers measure these important differences - and more importantly, take action on these new insights." Finally: note that this feature works for all paid search advertising, not just Google AdWords. It will roll out to all users in the coming weeks. To get started, use the step-by-step guide to set up separate brand paid search and generic paid search channels. We’ve already suggested brand terms for every GA view with sufficient paid search traffic. Many advertisers with paid search campaigns advertise on queries mentioning their brand (e.g., “Motorola smartphone” for Motorola) and also on generic searches (e.g., “smartphone reviews”). Because the performance metrics for ads shown against brand and generic queries can be vastly different, many advertisers prefer to analyze these two groups separately. For example, all else being equal, searches containing the advertiser’s brand name often have higher clickthrough-rates than those that don’t.